I’m happy to see you in Sochi despite the rain. Our meeting venue has not changed, but this year we have come to a completely different city, a beautiful and, I hope, comfortable city that hosted the Winter Olympics six months ago, which Russia won. Of course, we’d like to continue this tradition. But today we have not gathered for a sports competition but for a series of debates. I hope the discussions, which have already begun, will be interesting and will produce a positive result. For nearly 25 years, a new Russia has been developing relations with its partners. It has become so closely integrated in the global economy and political structure that its relations [with the other countries] should have only grown progressively, although at a different degree of intensity. Honestly, all of us, and I personally wanted this, considering the values we have in common and our willingness to respect the national interests of other countries and a desire to avoid confrontation, let alone military confrontation. Half a year ago we relied on these precepts, which seemed inviolable to us. I’m talking about this at the beginning of my address in order to explain Russia’s stand once and for all. Everything changed in 2014. I’m sure that this year will go down in history as a turning point not only for Russia but also for the rest of the world. It provided a point of reference for a new age. Confrontation in Ukraine, which has deteriorated into a civil war, Crimea’s reunification with Russia, which saved the peninsula and its people from the scourges of that civil war, the introduction of sanctions against Russia and, regrettably, a cooling in relations with our Western partners have forced us and our foreign colleagues to rethink the global system of reference we lived in before. Unfortunately, our views of this system differ. We in Russia sometimes think that many of our Western partners – though not all of them, of course – no longer remember that Russia has its own national interests, that thousands died in the centre of Europe, and that the very system of European security has been threatened alongside basic values, the future of globalisation and, actually, the very philosophy of peaceful development after World War II. For some reason, some of our Western partners believe that turning up the pressure on Russia and continuing along the lines of the infamous containment policy is the only solution. For several months now Russia has been playing sanctions ping-pong of sorts with the West. Our partners came up with a new package of sanctions only a week ago. It should be noted that they contradict, rather than reflect, the developments on the ground, since a peace process, however fragile it is, has begun in Ukraine. But Russia is still being pressured by Western sanctions. We were not the ones who started this standoff, but we were being forced to retaliate. I would like to highlight certain facts. Although they are well known, it's hard to keep them all in your head at once. Over the last century, Russia has repeatedly faced various sanctions. Repeatedly. There can be different perspectives on the reasons behind these sanctions, as well as the social and political system on the territory of what is now Russia – I’m talking about the Soviet period – but one thing is clear: we have always overcome these sanctions. Let me remind you that in 1925, Western nations, including the United States, stopped accepting payments in gold for equipment. In 1932, imports from the Soviet Union were totally banned. In 1949, the Coordinating Committee for Multilateral Export Controls, the infamous CoCom, compiled a list of products and technologies that could not exported to the Soviet Union in line with a strategy of controlled technological inferiority. In 1974, the Jackson-Vanik amendment we all love so much was enacted, making normal relations with the United States impossible. In 1981, the United States embargoed deliveries of construction materials for the Urengoy-Pomary-Uzhgorod gas pipeline. Nevertheless, it was still built. In 1998, the United States imposed restrictions on Russian research institutions that were merely suspected of cooperating with Iran. There have been other, less important decisions as well. Let me ask you a question: did any of this undermine the development of our country? If history is any guide, all such attempts to pressure Russia turn out to be ineffectual. It is clear that economic intimidation is not the way to deal with our country, as with any other country. Russia is the biggest country in the world in terms of land surface, with a population of almost 150 million people. We are a nuclear power that has abundant natural reserves, and is a major market of goods, services and investments. What do our opponents want? Do they want to build a new world order based on a hard-edged standoff, or just pretend that Russia doesn’t exist? Isolate half of the European continent from the outside world? This is impossible. It has been proven by attempts to pressure smaller nations, so it goes without saying that it won’t work with Russia. That said, we must look the truth in the eye. There’s nothing to like about the standoff over sanctions, and it benefits neither Russia nor the West. In previous episodes, as well as now, we all stand to lose. In the past, predicting how sanctions would play out was impossible. The same is true today. I recall the 2008 crisis. It was driven by purely economic causes, but now we are facing political challenges, subjective perspectives. No matter what sanctions are introduced, it is hard to evaluate the resulting damages, while the West can hardly guess how we will retaliate against such actions. Most importantly, predicting how sanctions against Russia will impact the global economy in the long run is impossible. Russia is the world’s sixth largest economy. Make no mistake, the global financial and trade infrastructure are being destabilised. However, it goes without saying that this process can be stopped. There is another important difference, with the beginning of the global financial crisis in 2008. I remember this period all too well, because back then I had to attend all major summits. Back then, we made joint efforts in removing barriers to trade, mutual investments and competition, primarily within the Group of 20, which was established at that time and served as a platform for bringing together such different nations. We worked together to drive the world out of the economic crisis by taking mutually beneficial decisions. We were open to what our partners were saying, and were ready to compromise. This is the road to success. I’d like to say that we are still ready to listen to our partners both in Europe and the United States on condition that they hear what we have to say. Despite sanctions, Russia does not shut its door to Western partners. Trade with the European Union countries amounts to about half of our external trade turnover. Over 60 percent of our foreign investment is in the EU. This is a huge sum – practically $100 billion. In turn, European companies are leading investors in the Russian economy. Their investment amounts to nearly $300 billion. Last but not the least, Russia remains a key supplier of hydrocarbons to Europe. So, I’d like to repeat: we are ready to restore dialogue but on equitable conditions. In this context, I cannot avoid talking about the Russia-EU-Ukraine triangle. Kiev has signed the EU Association Agreement, and this is Ukraine’s inalienable right as a state. It’s their decision, and I won’t comment on it. However, I’d like to recall that we’ve agreed with Ukraine and the leaders of the European Commission that the trade and economic rules of this agreement will become valid after 2016, or, to be precise, will not enter into force until 1 January 2016. We are ready to follow this logic, but we cannot allow a situation where separate provisions of this agreement that pose a threat to our market are carried out earlier. We don’t want goods of EU producers to come to our market on dumping prices as if they are exported by Ukraine, a participant of a CIS free trade area, because we haven’t agreed on that (we simply don’t have a free trade agreement with them). I’d like to inform you that today I signed a resolution imposing import customs duties on goods originating from Ukraine, which means that a regime of most favoured nation treatment is introduced. This concerns Ukraine’s exports of food, products of the light and processing industries, and some other commodities. These duties will be imposed if Ukraine decides to apply economic articles of the agreement before the aforementioned date. This will happen if Ukraine starts legal implementation or de facto application of these provisions. We are making all these steps only to protect our producers against unfair competition. We all remember how much time and effort was spent on developing Russia-EU relations. We appreciate this, and we wouldn’t like these efforts to develop ties with the EU over two decades to go down the drain. Naturally, European business people understand this much better than politicians. In general, politicians understand less about how the world is arranged. Producers from other countries know full well that market niches do not stand empty for a long time and will be occupied very fast. We primarily rely on domestic producers, but our Customs Union and CIS market is open to foreign companies, to companies from Asia and Latin America. Naturally, we’ll develop these relations. Russia’s rapprochement with Asia is an entirely objective process for geographical and other reasons. We started consolidating our presence in the Asia-Pacific region long before the deterioration of relations with Europe. Practically, we’ve conducted this policy for over a decade. Attention to the East and invigoration of trade, economic and investment cooperation with Asian countries have become a major component of Russia’s foreign trade strategy. We have stepped up our activities in regional organisations. Russia officially joined the Asia-Europe Meeting (ASEM) in 2010. In 2012, we hosted the APEC summit in Vladivostok. However, we are not yet moving fast enough – at the pace that we and, I hope, our Asia-Pacific partners require. Three-quarters of Russia’s territory lies in Asia, and we cannot afford not to have an active, future-oriented strategy in this region, all the more so since it is the fastest developing region in the world. I’d like to emphasise that I’m referring to cooperation with all countries of the region – both giants like China, India and Japan, and smaller economies. We are interested in all of our Asian partners. Speaking of Russian exports without account of fuel and energy, 34% go to Europe and practically the same amount, 32%, to Asia, the Middle East and North Africa. As much as 42% of our imports come from the EU and about 35% from the APEC nations and India. It’s obvious that Asia’s share should grow. And it’s obvious that we should develop Siberia and the Russian Far East. In this sense, our cooperation with our Asian partners for implementing the key 21st century project – the development of our eastern regions – has huge potential. To make use of it, we have launched a programme of priority development areas. We have selected the 14 most promising areas. I hope the related bill will be submitted to parliament and adopted this autumn. A few weeks ago, on 1 September, we launched the construction of the Power of Siberia gas pipeline. It will enable us to increase gas delivery to Asian-Pacific markets and also to accelerate the connection of domestic users to the gas distribution system in Eastern Siberia and the Russian Far East. We chose the gas pipeline route so as to ensure the largest possible supply to the national territory. We have also launched large-scale transport infrastructure projects to attract transiting routes from Asia Pacific. I’m referring primarily to the renovation of the Trans-Siberian Railway and the Baikal-Amur Mainline (BAM) which is aimed at increasing the capacity on these routes. Investment in these projects will exceed 500 billion roubles. Next, we are renovating commercial seaports and Europe-Asia motorways. In fact, the development of Siberia and the Far East will boost the development of Russia as a whole rather than only these regions. We’ll focus our strategic efforts on three goals. First, we need to strengthen trust between Russia and the Asian nations at the government, corporate and, of course, human levels. There will be no investment without mutual trust. Second, we need to broaden our involvement in regional affairs in response to the nascent demand for relations with Russia. So far, Moscow, meaning Russia, has been doing less than the regional players expect from it. The situation in Asia has been developing dynamically. A new architecture is arising there, and we continue to maintain equal and friendly relations with all nations of that region. I hope we’ll make use of all our available opportunities. And third, we must remember that Asian-Pacific nations are serious partners in terms of cooperative high-tech and financial projects. Very soon, in mid-October, an Open Innovations international forum will be held in Moscow. We hope our Asian partners will attend it. I hope everyone understands that our new strategy in Asia is not senseless revenge against Europe, contrary to what many Western political analysts say, but a logical development and a substantiated response to the changing economic landscape. On the other hand, it is true that an increased role of Russia in Asia and its contribution to the development of a new configuration of cooperation will definitely strengthen our prestige in other parts of the world, including the West. To promote Russian interests in Asia Pacific, we need to coordinate the efforts of all levels of authority and the business community and also to actively involve leaders from all of Russian regions in this work. We have issued the relevant instructions to the ministers. The task is to streamline the work of intergovernmental commissions and to create new business councils and tools for promoting not only trade but also investment cooperation. To be able to develop and to access new markets, we need to have a competitive economy. This is what I’ll address next. I will outline the current situation – you know about it, of course, but I think I should say a few more words on this. 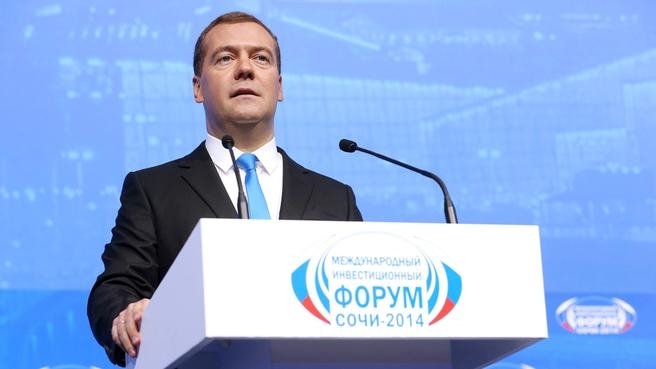 In the first eight months of this year, Russia’s GDP has grown 0.7%. The annual GDP growth in 2014 should be about 0.5%, according to the Ministry of Economic Development. The average annual GDP growth over the past five years was slightly more than 1%, which is not much, but the slowing trend was mostly due to low investment activity. In January through the end of August this year, investment in fixed capital slumped by 2.5%. Industrial production grew slightly, by 1.3 percent in the eight months, following a pause last year. This looks a little better now. Agriculture seems to be growing more quickly than other sectors, which is certainly a good thing. In January-August, agricultural production rose five percent year-on-year due to a good harvest, but also, I hope, due to the structural decisions we have been making to promote agriculture development. Real wages and people’s incomes continue growing, although more slowly than before. The labour market remains stable. Unemployment hovers around five percent (excluding seasonal factors), down from 5.7 percent last year; it has actually slightly declined. The main macroeconomic indicators, such as government debt and budget deficit, are stable. We have also managed to maintain most of the international reserves. However, economic growth proved far slower than we had predicted. We expected a faster and more substantial revival by mid-year, as compared with January. Unfortunately, changes in the economic situation have forced us to adjust the medium-term forecasts as well. Next year’s GDP projection has been downgraded to 1.2 percent, while in 2016 and 2017 it is expected to grow by 2.3 and three percent, respectively. We had to adjust our inflation predictions as well; its current level is over 7.8 percent year-on-year. Some experts believe this to be caused by the combination of three crises: a structural crisis, a cyclical crisis and another one related to a worsening economic environment, adversely affecting the Russian economy. It is certainly tempting – for any government – to blame the economic difficulties on external influences. The European economic sanctions would have been a perfect excuse to blame our problems on our opponents. But let's be honest: we do have internal issues that hamper growth. I am referring, primarily, to infrastructural limitations, sluggish investment and ineffective institutions that are in dire need of renewal. This is the domestic political agenda we are going to stick to in our work to continue implementing our core plans. These plans are listed in the country’s development programme until 2020, President Vladimir Putin’s executive orders issued in May 2012 and the Policy Priorities of the Government of the Russian Federation, and in government programmes. So let me emphasise that our priorities remain unchanged. Therefore, all this talk about a U-turn in Russia’s economic development model, building the so-called “mobilisation” or “closed” economy, is irrelevant. This is not what we need. Russia does not need such an economy, and no country does. We will not change our course now, and will stick to our major macroeconomic policies. We will preserve the budget rule, the taxation system principles, fundamental institutions, floating exchange rates and currency interventions, and if needed, inflation targeting and budget balancing. This is actually a real achievement we have made over the past 15 years. Admittedly, we will need to make some adjustments due to the influence of external factors. We have to address these issues within a narrow corridor of possibilities, with limited financial resources and certain technological limitations. We have to use every opportunity but take these limitations into account while making our general plans. I would like to make a few points here. The first possibility is cutting spending while drafting the next federal budget. This possibility is always being considered. I am talking about a significant reduction here. This is the most simple and obvious step to take, but it is also the most unpopular and painful policy. Still, let me remind you that Russia is a “social welfare state,” according to the Constitution, and we never cut social spending whatever economic difficulties we face. All of the Government’s social commitments will be fulfilled, through the combined effort of the federal and regional governments. But I am not saying we will abandon our cost-cutting plans. We have made some reductions and optimised certain expenditures, which can be much more effective with wiser and better administration. Allow me to say this again: the Government needs to learn to spend money as wisely and efficiently as businesses do, or at least to try to do so. I recently signed a resolution setting up a government commission on optimisation and effective budget spending. I hope that regional governments will take similar steps, and that state-controlled companies will do the same. The second way of doing it involves a massive increase in public investment. As you may be aware, the total assets of the National Wealth Fund (NWF) and the Reserve Fund amount to 6.5 trillion roubles, which is ample. We can invest in particular projects to speed up economic growth. In other words, we can infuse the money into the economy. The initial effects will be felt in the short-term (a year or two), however the ripple effects, in terms of inflation and changes in macroeconomic environment, will be fairly important, and correcting them could take more than one year. In addition, if we channel all the money into economy, we will lose the reserves that serve as insurance protection for us and our children. Speaking at this Sochi forum a year ago, I announced our plan to provide funding to several infrastructure projects. The Government approved the allocation of slightly more than 400 billion roubles from the NWF. We are investing the NWF funds into major projects. I have already mentioned two of them – the Trans-Siberian Railway and the BAM. The third project is the construction of a Central Ring Road motorway in the Moscow Region. In addition, we have some other projects on bridging the digital gap and developing intelligent networks. The funds are provided on terms of co-financing, and we spend this money sparingly. This is what the second option is all about. There is a third option as well, but it involves taxes. I mentioned earlier that we will keep the basic foundation of the taxation system unchanged. We realise that a significant increase in the tax burden is a grave decision in such difficult times. Even now that the external sources of borrowing are blocked, we decided not to increase the base tax burden. We did not increase the VAT, realising that this will further complicate the already difficult situation of our entrepreneurs; on the contrary, we must improve the business environment. We decided not to raise the personal income tax, so as not to reduce the take-home remuneration of our people, and left the flat tax rate unchanged, although it is being occasionally attacked. Following a long debate, we have also dropped the idea of introducing a sales tax. Certain regions, especially the larger ones, which were supposed to introduce this tax at their discretion, would have certainly benefitted from the additional revenue. But, unfortunately, in this case, especially amid exacerbated inflation, our people would be hit hard; therefore, we decided to refrain from introducing this tax. Nevertheless, in order to increase the taxation base of local governments, the regional authorities will be accorded the right to levy special charges from retailers, caterers, taxicabs, as well as tourist and resort fees. It is important to improve the administration of existing taxes. In the near future, we will focus on straightening things up in levying excise duties on alcohol. Even under conservative estimates, better collection of excise duties would bring an additional 200 billion roubles in budget revenue. Notably, all three options that I mentioned are not perfect, so we will try to carefully combine these approaches without going to extremes. No matter how the sanctions scenario unfolds, we must focus on expanding the domestic market, especially for import substitutions. Several sectors of the economy have significant potential in this area. Sanctions can and should be used to provide new opportunities for growth. On our side, this is, unfortunately, a kind of protectionism that was imposed on us, which we would never think of introducing in a different situation. Unfortunately, we were forced into this situation, and we will therefore take advantage of this opportunity. We can add capacity in the food and the pharmaceutical industries. Prospects are good for aircraft and shipbuilding, the aerospace industry, the radio-electronic complex, and the automotive industry. Of course, the industries and the specific businesses that were affected by the sanctions need special attention on behalf of the state. The Government is already providing support to them, which goes beyond financial assistance. I told our sales representatives abroad to start looking for alternative suppliers of high-tech equipment. We need to build a better balance between the domestically made and imported goods, especially when it comes to manufacturing and technology used in the defence industry. We can produce many civil products domestically, and we are creating proper environment for this. Plans to promote import substitutions in the industry and agriculture in 2014-2015 will be approved before the end of September. What will be part of these plans? First, we’ll support our companies with customs and tariffs if need be. We have the opportunity to do this. Second, we’ve made a decision to establish an industrial development fund with a view to grant loans to medium-sized companies before they appeal to banks. They will receive loans before their products launch into commercial production. Over 18 billion roubles will be allocated for this purpose in the next three years. Third, we imposed restrictions on some defence, security, machine-building and light industry imports in our contractual system. This is world practice – to close the market a bit and to regulate the system of state purchases. We’ll do this with caution so as not to harm existing projects on localisiation and technological cooperation with our foreign partners. Fourth, and I want to emphasise this, we’ll go on developing our agrarian sector. To support this sector it is not sufficient to allocate more money (we’ve already planned such allocations in the draft budget). We must also make other decisions in this respect. We are preparing amendments to the state programme of agricultural development. It will contain new segments that will facilitate import substitution – dairy breeding, beef cattle breeding, gardening, and vegetable growing in the open and greenhouses. Naturally, we’ll improve the finance and lending instruments of supporting the agro-industrial complex. Experts are making all relevant calculations now. I said at yesterday’s State Council meeting that we decided to pay all debts on subsidising loans for agro-industrial companies before the year’s end and plan to spend 20 billion roubles for this purpose. The economic prosperity of our country is based on the achievements of all citizens and all regions. This is team play in which the success of each player is part of the common result. The improvement of the business climate in the country or a particular region is the primary condition for reaching this goal. This cannot be accomplished without removing infrastructure and institutional restrictions. A progressive, modern legal foundation is a major factor in economic development. In the past few years, the Government has largely improved federal legislation to remove administrative barriers. It has been doing this in cooperation with the business community and relying on assessments of regulating influence and expert opinions. But much work is still ahead, both at the federal and regional level. I’m referring to law enforcement practice and local normative regulations. Regrettably, our investment climate is very different in different parts of our country. Access to affordable funds is the main headache for small companies. Their demand for long-term loans is enormous today. Far from always banks take the risks of financing small companies. The limit of warranty cover expires fast and whole economic sectors are going hungry. To break this vicious circle we’ve decided to establish a federal warranty fund. I said last year that we were going to do this. The Agency for Loan Guarantees with a charter capital of 50 billion roubles has already started working. Nine warranties were issued in the past two months. I hope this practice will expand quickly. We don’t know how many warranties will be required but expect their total amount to run into the hundreds of billions in the next five years. I do not include in this number the potentialities of regional funds but I expect them to reach another 230 billion roubles. We are making good progress with our business initiative. The time for processing documents is being reduced in many areas, including the state registration of title rights to real estate. The cost of securing a technological connection to electric circuits has decreased by almost 70 percent. There are positive changes in the construction industry and customs administration and we’ll continue working in this regard. We understand that all of these progressive initiatives may get stuck at the middle level of the Government machine. Much depends on the performance of governors in this respect. There are examples when regional authorities are very good at attracting investments even without having substantial natural resources. But there are negative examples, too. We must multiply success stories. Therefore, I suggest that budget support from the centre should depend more on the efforts of the regional authorities to create a comfortable business environment. With this aim in mind we are introducing performance standards for regional government bodies all over the country. We’ll provide incentives for the leaders. I’d like to emphasise that the more dynamically a region is developing, the better business conditions it will have and the more federal support it will receive. This is how it should work. Yet, no matter how quickly a region grows, they all face problems that need to be addressed, where the federal Government’s assistance becomes crucial. I am referring to debt relief for the regional governments, which should increase their spending potential. We are helping them to replace expensive commercial loans with government loans. To avoid growing the regional budget deficit, we have increased the volume of government lending and have cut the interest rate to 0.1 percent. The financing can be used for other purposes aside from curing the deficit and bridging cash gaps: the money can be used to repay commercial debt, and this policy will be continued. Financial support is not the only way the federal government can help. I have instructed the Government, following the previous forum, to draft proposals on handing over some of the federal authority to regional governments. The Government eventually submitted a bill to the State Duma allowing the federal Government to hand over specific powers to the regions without adopting additional legislation, which makes the process much faster. This bill was adopted in the first reading. The new law will provide regional governors with an additional resource to support businesses. We have often discussed the excessive concentration of authority with the federal government, and the need to share some powers with the regions over the past few years. However, this process is unwinding more slowly than we expected. Federal agencies are showing obvious reluctance to relinquish authority. The political responsibility for the investment climate largely falls to regional and municipal leaders, while federal agencies in those regions that seriously influence the situation often bear little or no responsibility for the comprehensive economic development of the region, or for investment activity. This is an obvious inconsistency that should be eliminated. This year we also started an experiment. A large share of federal powers was handed over to the two new constituent entities of the Russian Federation: the Republic of Crimea and the city of Sevastopol. It is premature to draw any conclusions at this stage, but in any case I have not heard of any serious mishaps or problems there. This suggests the arrangement is working, and I think this experience can be extended to other Russian regions. Colleagues, governors, I wish to address you directly. The Government currently enjoys colossal popular support, which has been sharply increased by Crimea’s return to Russia. Now we are facing the unprecedented task of reforming all areas of life there in accordance with Russian standards without affecting the well-being of other Russian regions. Crimea and Sevastopol did not only function within a different legal framework as part of Ukraine, they are decades behind most Russian regions in every respect. We actually had to pull the new regions from the 1990s and into the modern day. So everything that we achieved, whatever success we’ve had, was due to cooperation between the regional and federal authorities. This was a good example of how extremely complicated problems can be addressed successfully if there is a will. Crimea’s appearance and condition in a few years will serve as evidence of how effective and attractive our development model is. Yet, we all understand that implanting the Russian economic model will not be successful without people’s trust. Crimean residents have in fact given us a lesson of how we should believe in Russia and how we can achieve truly historic results. Today we have a unique opportunity to convert people’s confidence in the Government into development and construction, to channel this enthusiasm and energy to shaping a positive agenda. We need to support our people, to give them a chance to work and make money for themselves, and consequently, for their home region, for their home country, to support everyone who wants to start up a business and protect them from unscrupulous officials. This is something we can do. We are all aware that things will not be easy. Last year, I said – although in a different place – that the time for easy decisions has gone. I could not even imagine then how difficult the future would be. But everything is relative. Albert Einstein once said, “In the middle of difficulty lies opportunity.” We must seize it. Thank you.